PETITION ON BEHALF OF THE PETITIONER UNDER SECTION 13 OF THE COMPANIES ACT, 2013 TO OBTAIN CONFIRMATION OF THE HON’BLE REGIONAL DIRECTOR TO THE PROPOSED SHIFTING OF THE REGISTERED OFFICE OF THE PETITIONER COMPANY FROM THE NCT OF DELHI TO THE STATE OF HARYANA. 2. A copy of the Memorandum and Articles of Association of the Company containing the Certificate of Incorporation is enclosed herewith and marked as Annexure - 2. 3. That the detailed objects of the Petitioner Company are set out in the enclosed Memorandum of Association of the Company. 5. That the present Authorised Share Capital of the Company is Rs. 5,000,000 (Rupees Fifty Lacs) divided into 5,00,000 (Five Lacs) equity shares of Rs. 10 each. The Present Issued, Subscribed and Paid-up Share Capital of the Company is Rs. 5,000,000 (Rupees Fifty Lacs) divided into 5,00,000 (Five Lacs) equity shares of Rs. 10 each..
5. A copy of the latest audited annual accounts of the Company for the year ended 31st March, 2014 is enclosed herewith and marked as Annexure - 3. 6. That a list of the Board of Directors of the Company is enclosed herewith and marked as Annexure - 4. 7. That as on the date of filing of this Petition, the Company has 2 (Two) Shareholders. List of the Shareholders of the Company is annexed herewith and marked as Annexure - 5. 8. That there is no respondent herein. 9. That the Board of Directors of the Company in the meeting held on --------unanimously resolved to shift the registered office of the Company from -----------to the State of-------------, subject to the approval of the members of the Company and subsequent confirmation by the Hon’ble Regional Director. RESOLVED FURTHER THAT Mr-----, Director of the company be and is hereby authorized to file the petition along with the required documents and paper before the Hon’ble Regional Director of the companies Northern Region, Noida and to appoint Authorised Representative to appear for and represent the company before the Hon’ble Regional Director of the companies Northern Region Noida and to do all such Acts and things as may be deemed necessary in connection therewith and incidental and ancillary thereto. b) A copy of the EGM notice along with Explanatory Statement and Extracts of the Special Resolution passed at the EGM are annexed herewith and marked as Annexure: 6 and 7 respectively. 13. That the circumstances which justify and necessitate the proposed shifting of the Registered Office of the Company from the NCT of Delhi to the State of Haryana. b. Shifting of Registered office of the company from the ------------to the State of ---------, will result in better control, co-ordination and reduction in costs. Thus by effecting the change, the affair of the company would be managed more economically and efficiently to the advantage of all concerned. 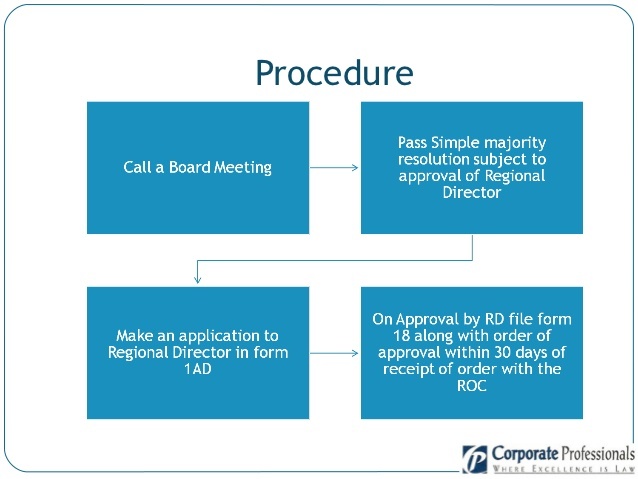 c. The Board of Directors of the Company, therefore, felt that in the interest of the Company it would be just, necessary, expedient and desirable to have the registered office of the Company in the State of ------. This will enable the Company to obtain optimum advantages which would immensely help the Company in future growth. d. The proposed alteration would not prejudice the rights or interest of any person whomsoever. e. The proposed change in the situation of the registered office would enable the Company to carry on its business more economically and efficiently. In other words, for better administrative control and convenience, the shifting of registered office from the State of ---- to the --------------is a necessity, so that entire activities of the Company could be conducted advantageously and conveniently. 14. That the Petitioner Company craves leave to refer to other relevant documents and/or records and to make further submissions in support of its case at the time of hearing, if necessary. 16. That if the alteration is allowed by the Hon'ble Bench, the Company would be able to carry on its activities more economically, efficiently and smoothly as provided under Section 13 of the Companies Act, 2013. 17. That the proposed change of Registered Office of the Company would not prejudice the rights or interest of any person whomsoever and it is just and equitable that the proposed alteration be confirmed. 18. That the Company is carrying on the business as on the date of filing of this petition and no proceedings to wind up the Company have commenced nor is pending against the Company. 19. That none of the Directors of the Company has any malafide interest in the proposed alteration. 20. That this application is made bonafide and in the interest of the Company. 21. That the Petitioner Company confirms that none of the employees of the Company will be adversely affected due to the proposed shifting. Further, at present most of employees are based in and around the State of Haryana and thus will not be prejudice to their rights. An affidavit to this effect is annexed herewith and marked as Annexure 8. 22. That the Petitioner Company further declares it has not previously filed any petition regarding the matter in respect of which this petition has been made. Original copies of newspaper cuttings are enclosed herewith and collectively marked as Annexure 9. 25. That as on --------------(relevant date), the Petitioner Company does not have any secured creditor in the Petitioner Company. a) A Nil list of Secured Creditors of the Company as on ------------is enclosed herewith and marked as Annexure: 10.
a) Affidavit of the Directors verifying the Creditors’ lists are enclosed herewith and marked as Annexure - 11. 27. That an affidavit proving publication of general notice in the newspaper and service of notice of Petition on the Secretary of the Government of New Delhi is enclosed herewith and marked as Annexure - 12. 28. That a certified true copy of the resolution of the Board of Directors of the Petitioner Company, as passed in the meeting held on---------, authorizing the Directors to sign and verify the present Petition by means of an affidavit and to do other acts, deeds and things in respect of the petition, respectively are enclosed hereto and collectively marked as Annexure - 13.
b. 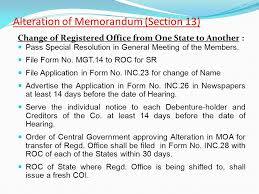 Pass such other/further order(s) as this Hon'ble Board may deem fit and proper.